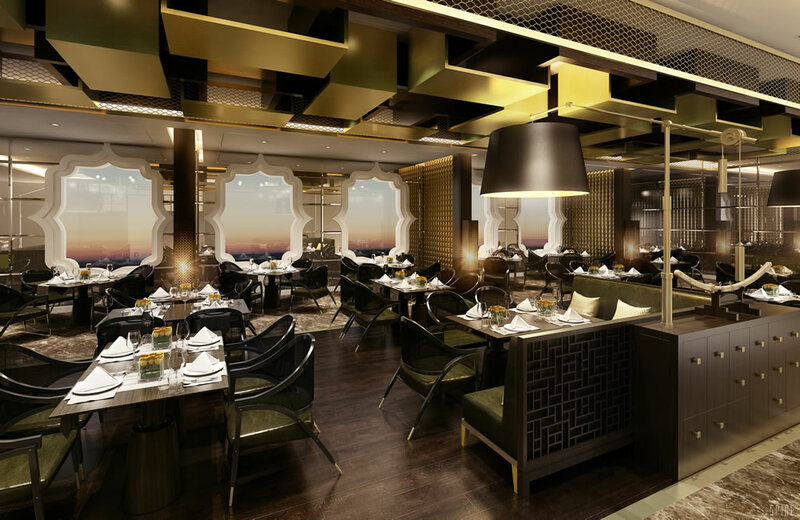 Regent Seven Seas Cruises has unveiled its plans to add pan-Asian restaurant Pacific Rim to Seven Seas Explorer, just days after Azamara Club Cruises announced it plans to add new pan-Asian restaurant Kibo to both their ships during their 2016 refurbishments. The Pacific Rim restaurant will sit alongside previously announced dining venues on-board Seven Seas Explorer including the chic Italian Riviera-inspired La Veranda, signature steakhouse Prime 7, and the main dining room Compass Rose. Images of these venues can be seen here. Pacific Rim will feature a diverse array of Pan-Asian dishes served within an elegantly appointed dining room. 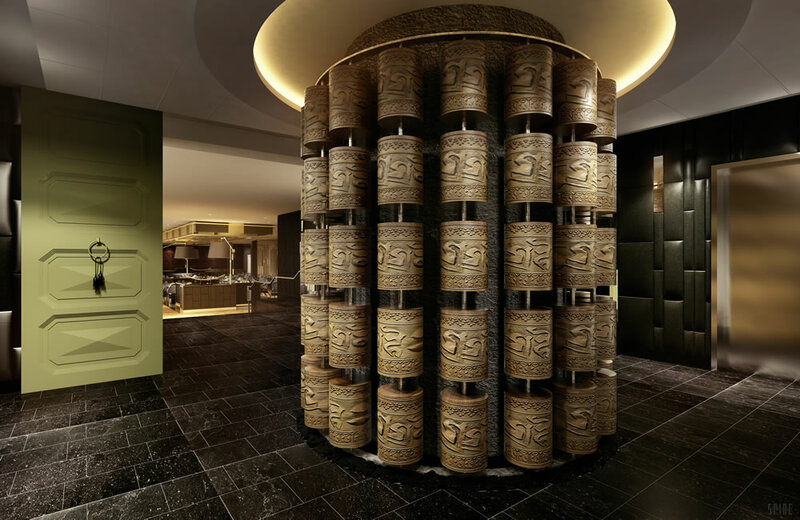 In the restaurant lobby, guests will encounter a modern interpretation of a Tibetan prayer wheel – a large, floor-to-ceiling cylindrical sculpture with decorative panels embossed with wishes for good fortune. The prayer wheel gives way to a dramatic entry flanked by doors reminiscent of an Asian temple. Upon entering the dining room, a dark and rich colour palette dominates the venue, with black mid-century metal and wood tables surrounded by leather banquette seating. D uring dinner, guests will be able to gaze out to sea through abstract lotus-shaped windows. Smoky mirrors between the windows will reflect muted light throughout the space. Floor-to-ceiling partitions will help convey a sense of intimacy. The inventive menu will be inspired by the diverse cuisine available throughout Asia, offering Pan-Asian creations. Examples of first courses include tempura-encrusted crispy soft shell crab with green chili aioli; caramelised cassia-braised pork belly topped with perfectly grilled diver scallops; and a seaweed and wakame salad drizzled with a black pepper soy and onion dressing. Examples of entrées include tempura-battered Canadian lobster with shiso leaf finished with an orange ponzu sauce and spicy may; miso-spiced black cod wrapped in hoba leaf accompanied by pickled daikon and spicy den miso; and grilled Korean barbecue lamb chops, wok-fried beans, eryngii mushroom and gochujang dressing. Dessert will include delicacies such as a banana and green tea cake served with coconut ice cream and matcha ganache. Seven Seas Explorer will sail its maiden voyage on 20 July 2016 and spend its inaugural season in Europe before heading over to Miami for a series of Caribbean voyages.